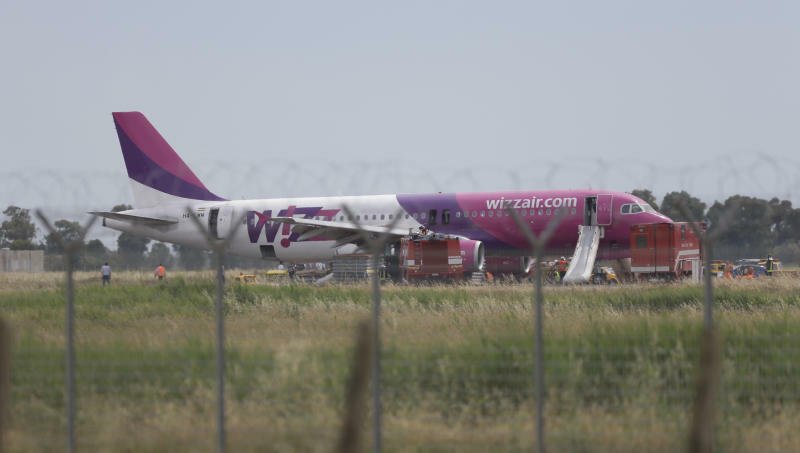 ROME (AP) -- Officials at Rome's Leonardo da Vinci airport say a Wizz Air jet has made a safe emergency landing there after reporting a landing gear problem. Wizz Air and airport officials say no injuries were reported, although officials said a few people requested medical checkups after passengers disembarked on evacuation slides Saturday morning. Airport police official Antonio del Greco said the plane was flying from Bucharest, Romania, to Rome's Ciampino airport when the pilot reported the problem and asked to land instead at da Vinci because it has longer runways. Del Greco says the landing was "carried out expertly." After landing, the plane tilted to one side, leaning on its left engine. The Hungarian-based airline says that 165 passengers and six crew members were aboard the Airbus A320.